This is not a complete game. To play, you must own a WW1 Rules and Accessories Pack or WW1 Duel Pack. The Aviatik D.I was a single-engine, single-seat fighter biplane. It was also known as Berg D.I or the Berg Fighter because it was designed by Dipl. Ing. Julius von Berg. The D.I was the first fighter aircraft designed by the Austro-Hungarian Air Service (Luftfahrtruppen). It was flown by a number of the famous aces, such as Frank Linke-Crawford, Karl Sabeditsch and Karl Turek. 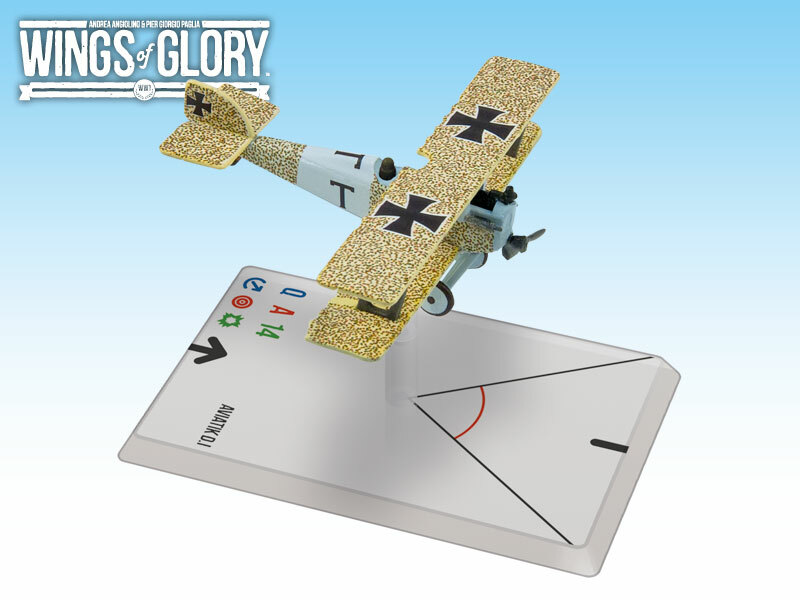 Designed to be used with the popular air combat game system created by Andrea Angiolino and Pier Giorgio Paglia, each WW1 Wings of GloryÂ® Airplane Pack is a ready-to-play model, painted and assembled, 100% compatible with any other WW1 Wings of Glory game product. In each pack you will find all you need to play with the airplane: a special base with gaming stats, a variable altitude flying stand, and a specific deck of maneuver cards.